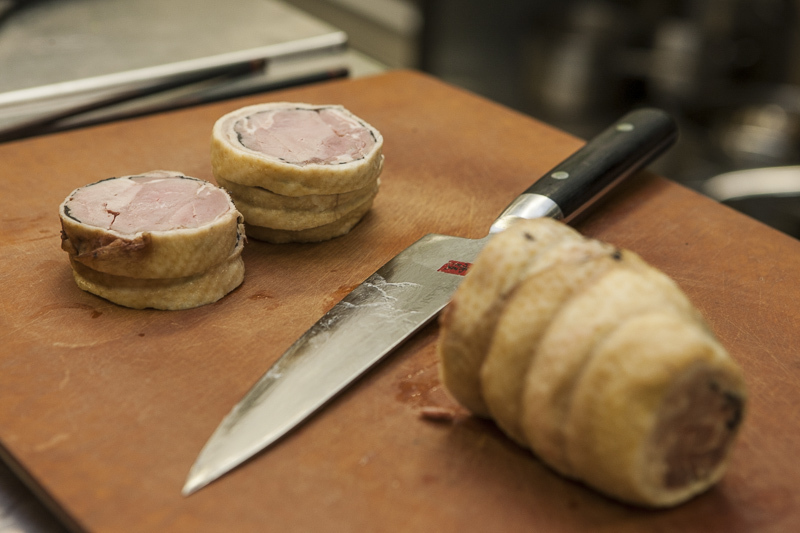 A sharp knife is important in order to preserve the true flavours of fresh ingredients. Cutting with a dull knife will damage food on a cellular level and alter it’s taste and appearance. 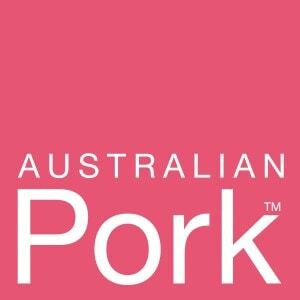 The quality of the cut is becoming an increasingly important issue in professional cooking. A sharp knife is also important for safety. A dull knife is more prone to slip on food and may result in bodily injury. Sharp knives are also important for kitchen efficiency. It will take more time and effort to cut with a dull knife than a sharp knife. Using a sharp knife is also undoubtedly much more enjoyable. Sharpening, or honing on a steel is a good in between measure. Steeling your knives will put tiny micro grooves along the blade that act like teeth to give it some traction during cutting. The steel will also realign any burrs that have formed. This method is widely used by chefs and butchers. However at some stage a stone is required in order to return a knife to a razor sharp edge. Hold the knife by the handle with your cutting hand and the steel pointing upwards at a 75 degree angle from the horizon with the other hand. Hold the handle end of the blade against the steel approximately 2cm from the tip of the steel. Set up the blade with a 15° to degree angle to the steel (20° for German or thicker knives and 15° degrees for Japanese or thinner knives). Draw the knife down the steel and towards the tip of the blade with light to medium pressure. Accuracy is more important than speed so take your time to keep the blade at a consistent angle to the steel. Repeat once on the other side of the knife blade with the opposite side of the steel and alternate sides for 5 to 10 strokes or until the blade is sharp. When honing on a steel no longer gives results it’s time to sharpen your knives on a stone. Don’t Buy A Cheap Stone. There is a vast difference in the quality of sharpening stones on the market. Buy only high quality sharpening stones from a company who is able to offer good advice on how to use them. A good stone will last from 2 – 10 times longer than a cheap stone and will be a lot less frustrating to use. Using Japanese waterstones is our preferred method of knife sharpening because it will give a superior edge to your kitchen knives. Although like anything it will require practice to perfect. The method of sharpening single bevel knives and double bevel knives is different but the tools are the same. All western knives are double edged. The vast majority of Chef’s Armoury knives are also double edged. “Arato” – A rough stone (200 – 800 grit). This stone is used for repairs and creating a new bevel on badly worn knives. Improper use may lead to a weak edge caused by making the edge too thin and sharpening incorrectly at varying inconsistent angles. “Nakato” – A medium grade stone (800 – 1500 grit) used for very minor repairs and creating an even burr, which is the first step in sharpening. 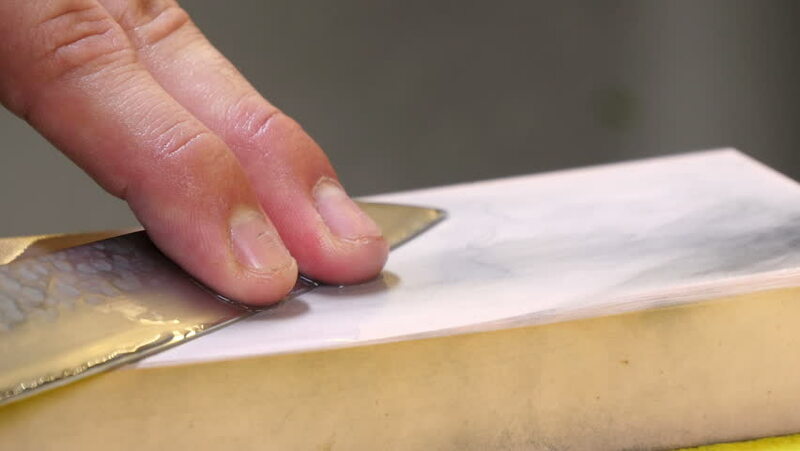 “Shiageto” – A superfine stone (1500 – 3000 grit) is used for creating a highly polished edge and removing the coarser scratches left by the medium stone. This is the stone that gives the feeling of smooth & sharp as opposed to just sharp. Some knife enthusiasts will also buy a finer 5000 – 12000 grit stone but this is unnecessary unless you really love your knives. Different sharpening stones are prepared in different ways. Some stones like ceramic stones are porous and need to be pre soaked. Naniwa Superstones on the other hand don’t need soaking but you need to keep the surface well lubricated with water. Also it’s best not to leave your stones in water for long periods as this may damage them. One essential thing to do is to keep you sharpening stones flat. Use a stone flattener or some wet and dry sandpaper on a flat bench top. After flattening put a slight bevel on the edges to prevent chipping. It is best to flatten your stones little and often. We recommend to lightly flatten your stones after each sharpening session as opposed to waiting until there is a big bow in the stone. There are a number of different methods for sharpening on waterstones but we will concentrate here on a method most suitable for beginners. Assuming there are no repairs needed and your knife has a basic bevel of sharpness, start with the medium grade stone – nakato. The most important things to remember are 1) technique and 2) keeping a constant correct angle. Depending on your knife you will need to hold the blade at a 10° to 20° angle to the stone. Rule of thumb is a German knife or a thicker blade requires a 20° angle. Thinner Japanese blades can go down to 10°, but unless you have a lot of experience with thin blades, a minimum of 15° is recommended. A smaller angle gives a sharper edge. A greater angle is not as sharp but the blade is less prone to chipping, so think about the purpose for which the knife is used for before deciding on the angle. Remember only very good quality knives with a high HRC (hardness rating) can hold a small angle, so don’t sharpen German style knives to less than about 18°.